In most places, I would go out of my way to frame a street scene to exclude the power lines. But for anyone who’s been there, there’s something about Mexican streets that would seem alien without electrical wires crisscrossing the skies overhead. It’s as much a part of the landscape as grass in a meadow. As sure as Mexican streets haven’t always looked like this, I’m sure someday the sky will be the only thing you see there when you look upwards, but there’s a charm to the way Mexican streets look now that I find strangely inescapable. I guess when that future date dawns, prints of Mexico like this will take on a nostalgic value. These particular Mexican streets are in Mérida, and it’s a scene that was captured on the last day of my week spent in the Yucatán. The sun on that late afternoon was just perfect. When you’re really fortunate, you have light like this that has an indescribable quality that brings life to a moment. As a result, the always bright colors were even more vivid and there’s such a great sense of depth that I almost feel I could reach out and feel the texture of that peeling paint. Do you have that same sense that you could use this print to walk into these Mexican streets? It’s always interesting to me how there are some locations that are fairly instantly recognizable. I suppose there are places where the local vibe permeates the very fabric of the architecture. And I’ve found Mexican streets like these fall into that category. Even if I didn’t know this print depicted a summer afternoon in Mérida, I would definitely have my suspicions it was somewhere in Mexico. The architecture, the colors, everything about this print has volumes of Mexican charm on top of that real life quality. 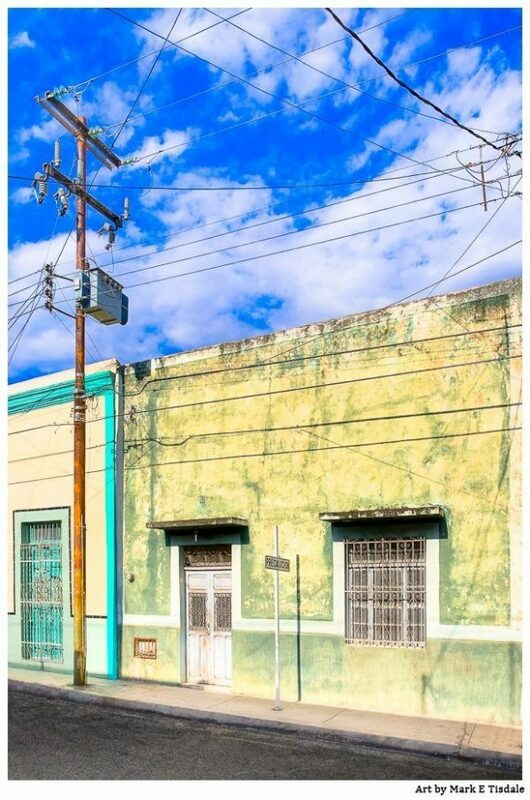 Does this print remind you of a sunny afternoon of your own enjoying the rustic charm of Mexican streets? Or perhaps you’ve never been but you simply love Mexican culture? Whatever attracts you most to this particular print, I hope you’ll take a moment to share those thoughts with me!